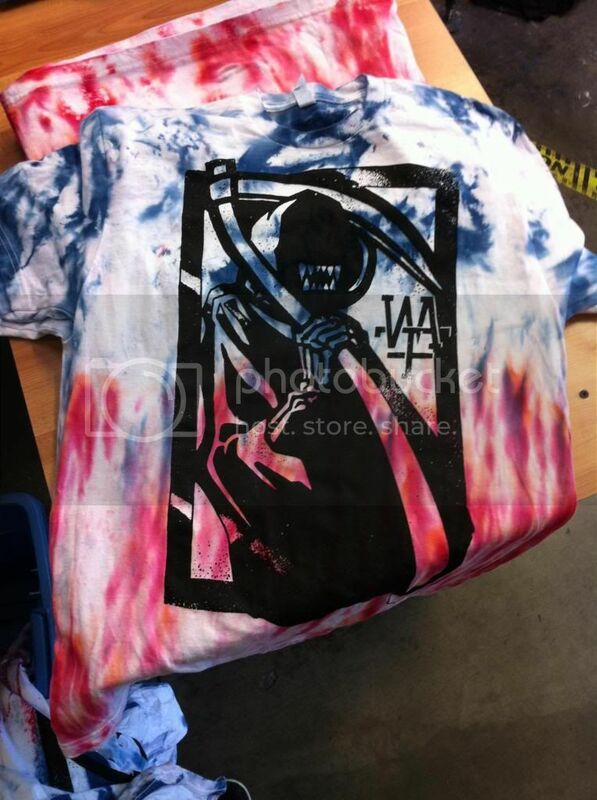 Here is a one color waterbase print on some tie-dyed shirts. Customer bought the blanks from me,tie-dyed them and brought them back for a one color imprint. Pretty cool effect. unusual looking shirts. Nice effect. Next time, suggest printing the shirt first and having them dye them afterwards. We use to over-dye a lot back in the day using plastisol and the effect was pretty well worth it. It'd be nice to see how it works out with water-based inks. Nice pattern, and I am imagining what it will look like if the pattern is made of hot-fix rhinestone. It will shine brighter. And from the pattern I can see a skeleton holding a sickle on the shoulder, but seemingly there is a girl in the pattern, am i right? www.cstown.com - Enjoy Free Custom Rhinestone Transfer Design Service. Nice pattern, it is more girlish tee.